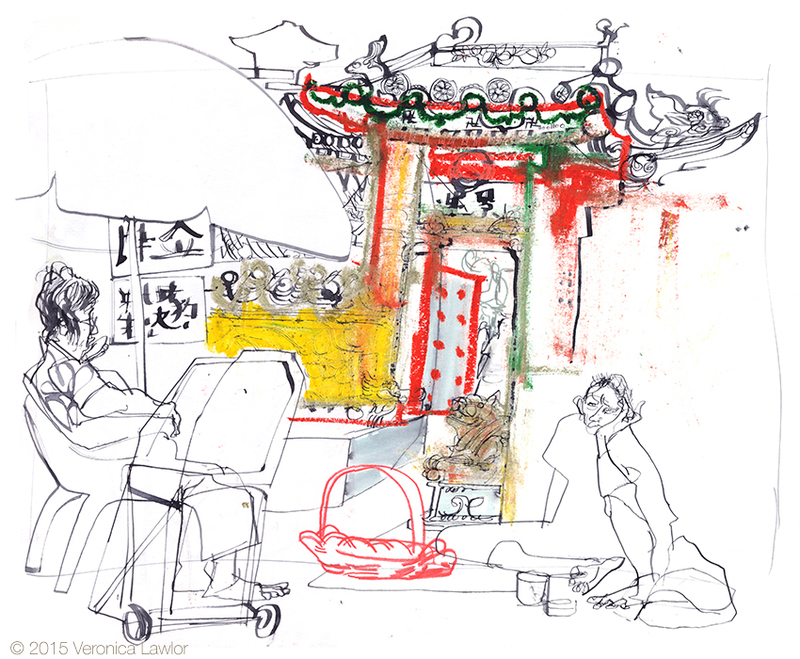 Thought I'd post a few drawings I made on Waterloo Street in Singapore, where I had the privilege of teaching a workshop called the Urban Sketchers Cookbook at the 6th Annual USK Symposium. Waterloo street is located somewhere between Little India and the Malay sections of the city. While in Singapore I was constantly impressed with how active all of the religious temples/churches/mosques were, and with how all these differing cultures and religions seem to co-exist harmoniously. All of the workshop instructors donated a drawing for a silent auction for USK scholarships. 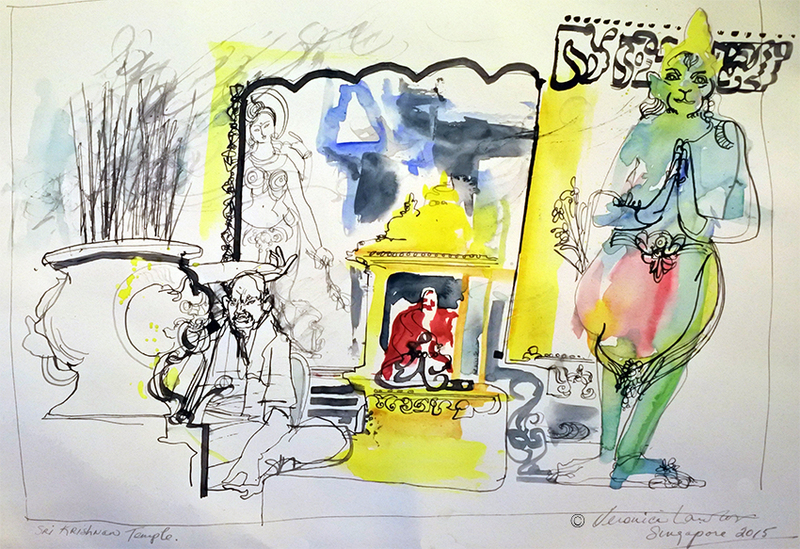 The above drawing of the Sri Krishna temple was my donation, in which I decided to work with the elements of my reportage workshop. 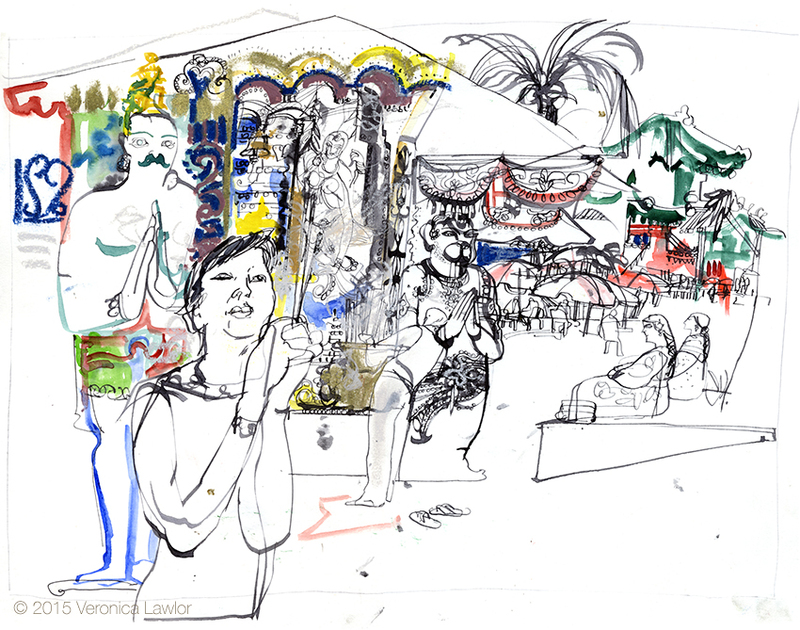 I was so impressed with this temple - and the rest of Waterloo street - that when I had time I went back to do a few more drawings. Here is the Hindu temple again - you can see the devotees praying with incense, and the Hindu gods and goddesses praying behind them. Also in the distance is the Chinese Buddhist temple - these temples from different religions and cultures are literally next door to each other, almost like a kind of religious-themed EPCOT. Amazing. The atmosphere near the Buddhist temple was somewhat livelier than next door at the Hindu one. And right outside of the Chinese Buddhist temple on Waterloo Street are some of the hardest working women I've ever seen. They sit under these umbrellas in the hot sun all day and sell flowers and incense to worshippers entering the temple. My understanding is that these offerings are for Buddha, and also for ancestors. Actually, there are many stores lining the street in which you can purchase gifts for your ancestors and deceased relatives to help them on the other side. Lin Chan, one of the attendees of my workshop - and a wonderful artist - explained the various gifts to me: paper money, so they can buy what they need; paper cell phones, to make calls if necessary; paper dresses to wear, etc. etc. The idea is to buy paper versions of all of these items and then burn them, thus sending them to the other side for your relatives to use. What an idea and way to connect and continue to take care of those we've loved and lost. And also, what a busy business goes on outside the temple to sell all of these offerings! Right outside the gates of the temple were more vendors, and some beggars too. It was a very active scene, and even the beggars seemed to be a part of a whole social eco-system. As I sat making the drawing above, a Chinese woman sat next to me hawking fans. I don't speak Chinese, but whatever catch phrase she was using, she was repeating about three times a minute. Became like a mantra. As I was finishing this drawing, the clock must have pointed to dinner time, because the entire operation - vendors and beggars alike - suddenly began to pack up and leave. The Chinese woman next to me, without missing a beat of her fan hawking, leaned over to me quickly and said, "Don't worry, they'll be back tomorrow!" I loved it! And wished that I, too, could be back tomorrow, but my plane for Thailand was leaving at 11 am the next morning. 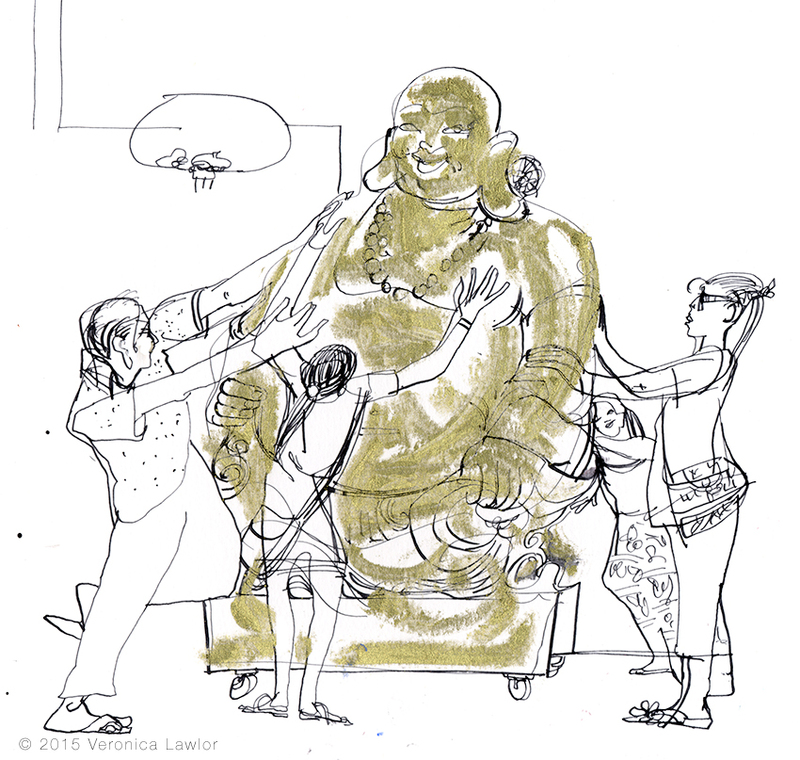 As I headed back to my hotel to get changed for the Symposium closing party, I had to stop and draw this joyful scene around the Golden Buddha. People were smiling, laughing, and posing with the Buddha; as well as rubbing his belly for luck. I did too, more to thank the Buddha for my luck in having been able to spend some time in Singapore. 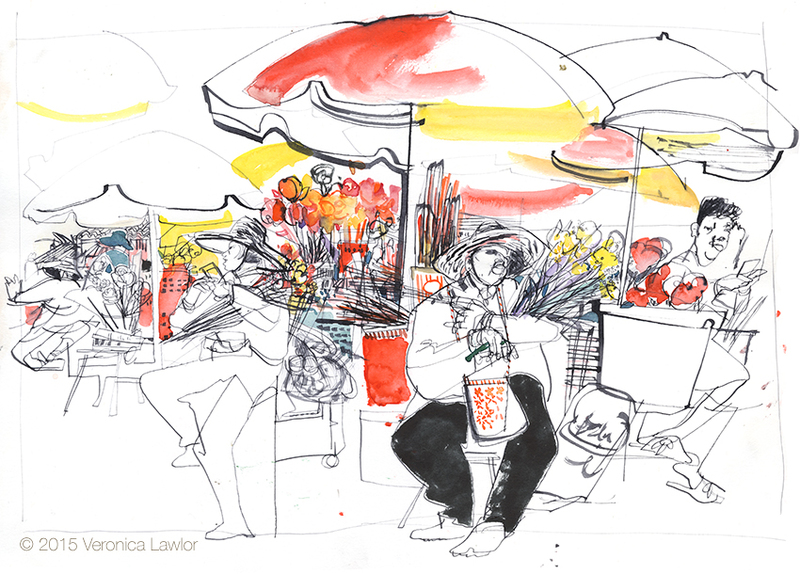 And of course, thanks to Urban Sketchers too. It is always such a pleasure and a privilege to be a part of the annual Symposium.